Yes, kids, there is an alternative to the big, bad SAT—it’s called the ACT. 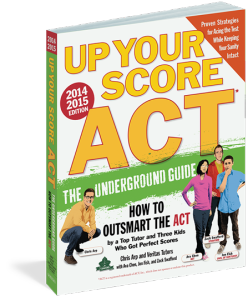 And yes, there’s now an alternative to the big, bad, boring ACT study books: Up Your Score: ACT, the prep and survival guide with attitude. Zinc veteran Chris Arp explains the essential strategies, based on Zinc’s techniques, for tackling each section, along with insight about how to choose between the tests and how to deal with potential stressors.